DoricDiv on Bush-biking ? What ? The dictionary defines confluence as “a flowing together of two or more streams or rivers”. It can also be used to mean “a coming together”. I quite like the latter. We have a confluence of rivers just outside Huntly. 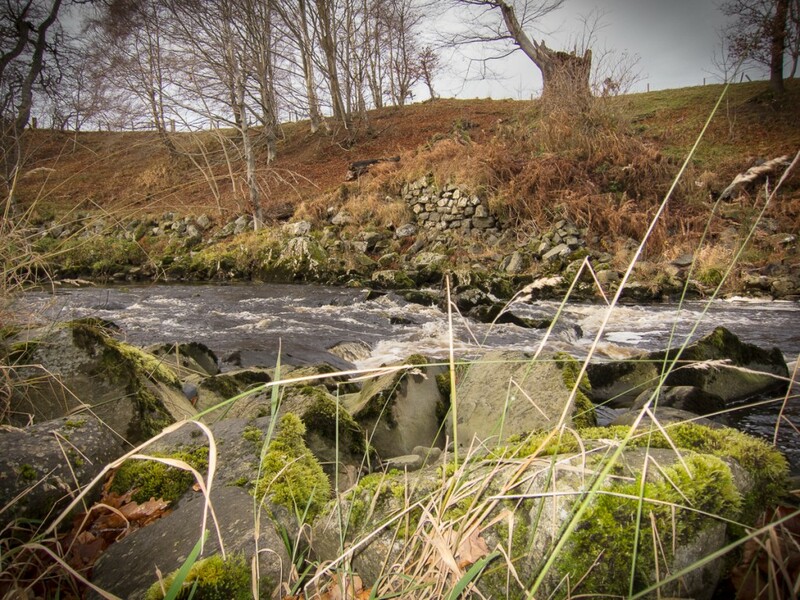 The rivers Deveron and Bogie meet north of the town. 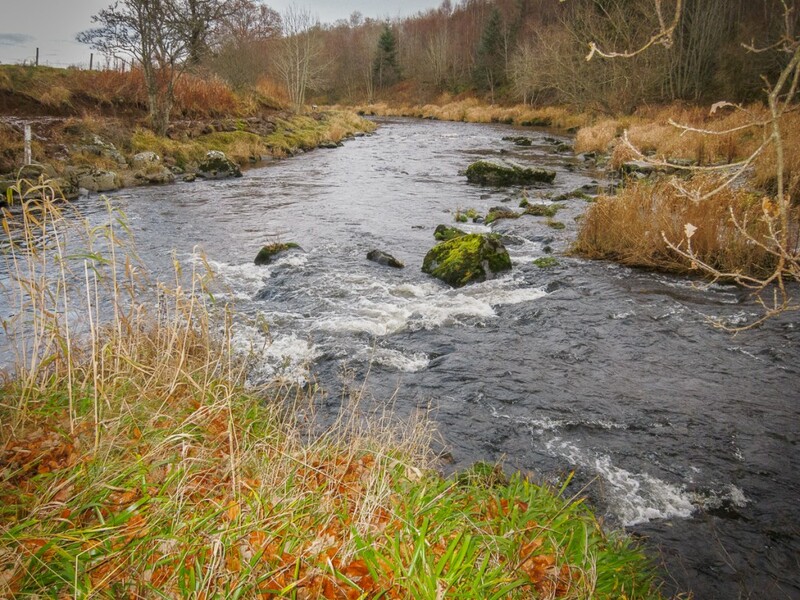 The Deveron flows 60 miles from its source near the Cabrach until it reaches the Moray Firth at Macduff. 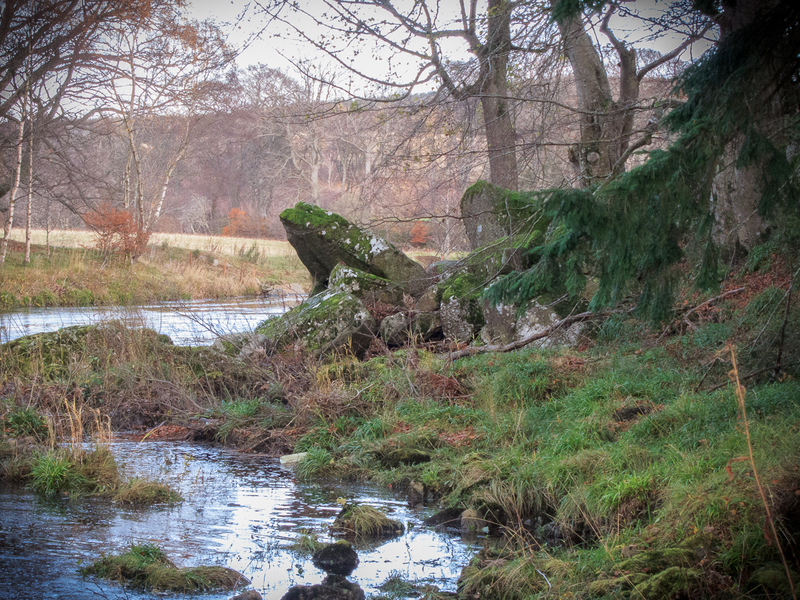 The Bogie flows flows 11 miles from its source near Rhynie until it joins the Deveron. Both rivers are embedded in the area’s history and both are good fishing rivers. Conveniently the Confluence can be accessed from the green at the 6th hole of the local golf course. However, cycling the length of golf course would probably cause the local golf community to be up in arms. 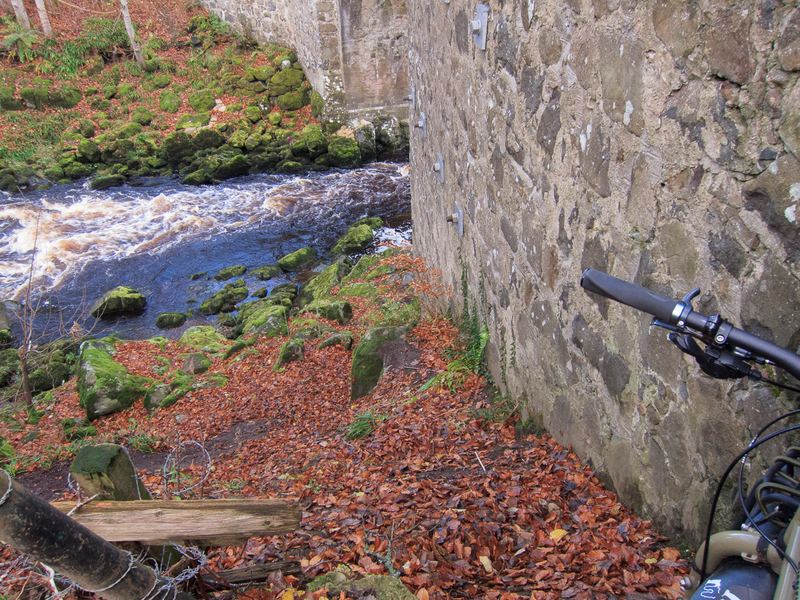 Thankfully there is an alternate route along the course of the River Deveron. A footpath follows the river from the old castle bridge. It’s quite rocky, rooty and overgrown. I would really describe it as an almost footpath. The last time I walked it was about 15 years ago. I have cycled partly along here, but never to the meeting of the waters. It wasn’t fun on a early millennium full suspension bike. However things have moved on and we have fatbikes now. You don’t need a fatbike to go exploring by bicycle. But it does make off the beaten track expeditions more fun and much easier. Fatbikes are simple. They usually have no suspension which means you don’t get thrown over the handlebars or dive down on rocky and rutted ground. They have 4” wide tyres running at about 6 psi and have the diameter of 29” wheels. These bikes roll over anything, offer bags of traction and are tough as nails. I’ve been thinking about this particular excursion for a while and finally decided to go for it last week. Setting off late in the afternoon, at around 2pm, I had about an hour and a half of daylight to accomplish my goal. Reaching the old castle bridge I stopped and observed the first obstacle. 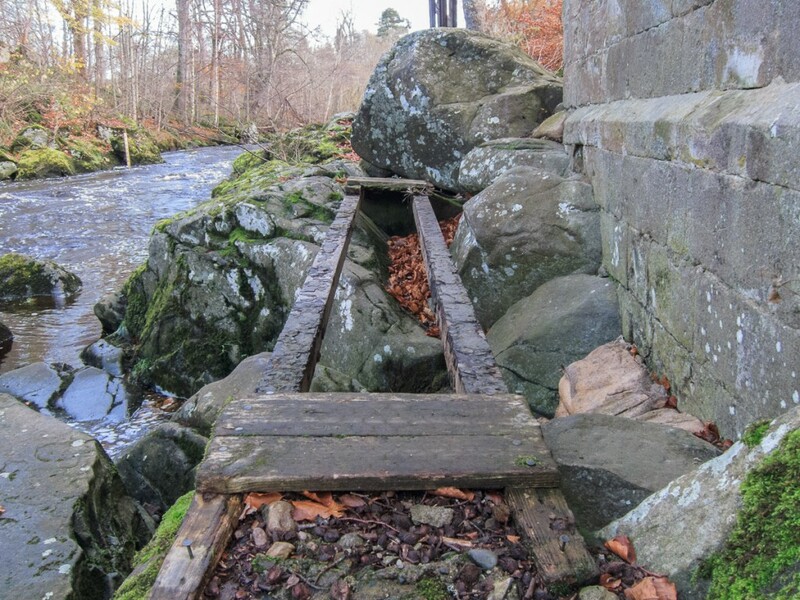 The old bridge dates back to around 1600 AD and records show that it may be older. Unfortunately it sustained severe damage and a partial collapse in the spate floods of 2010. Access to the river was via steps cut into the left hand bank but they have vanished. Weather erosion and lack of maintenance has taken its toll. I had the choice of a steep muddy slide or a steep leaf covered slide. As I was already part way down I chose the latter. It wasn’t difficult. It was a case of balancing my weight towards the rear of the bike. These descents always look harder that they usually are. And with having no front suspension to send me flying over the handlebars I didn’t need to precariously hang my backside centimeters from the back tyre. I reached the bottom and was greeted by a scene that could have been from the Goonies or Indiana Jones. All that remained of the old wooden walkway was two iron support bars. Thankfully I’ve watched both the Goonies and Indiana Jones . So I hoisted the bike on my back and walked careful across, straddling both bars. A short scrabble over debris from the fallen bridge and I was on my way. This was more like it. A blanket of rust brown leaves covered the path ahead. Trees wore their autumnal coat of golden yellow leaves. 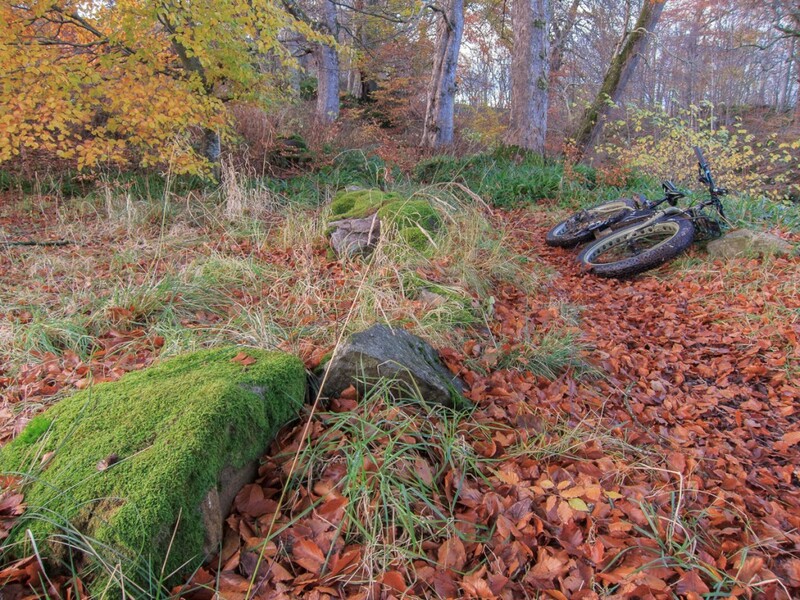 Thick green moss adorned the remains of a drystane dyke. This is what cycle therapy is all about. Getting out and about. Escaping into nature, even if only for an hour or so. Passing the fishing hut, I approached Stuartie’s Cave. It’s more of a group of overhanging rocks than a cave. I used to know the stories about Stuartie’s, but they elude me now. If anyone knows please post in the comments or on Facebook. I have lot of happy childhood memories here. This was one of the many places I frequented during the summer. We used to float down the river on inflated tractor tubes from Webster’s Tyres or The Argyle garage and swim in the ‘salmon pools’ as we called them. There was always a Tarzan swing on the tree so we could swing out from the big rock and jump into the river. As a child, the water was never cold ! Cycling along the flat section before climbing back up the track I was quickly reminded of the hidden danger of reed beds. My front wheel hit a rut and was deflected into reeds at the side of the path. Luckily I managed to stop before I sunk into the river. Continuing up the short climb and through some overgrown branches, my journey was halted abruptly. Below lay a steep hill with fallen trees blocking the path. In front of me the path was blocked by dense growing branches. Difficult to pass through when walking, and nigh on impossible dragging a fatbike. I could have walked across the 6th fairway to reach the confluence. But given it was close to sunset I chose to leave that option for another day. I cycled back the same route I arrived. My summer fat tyres sometimes struggling for traction on the wet leaves and mud that littered the track. I crossed the old wooden footbridge. This time walking the bike on one support and myself on the other. Far easier. I was wearing FiveTen shoes as they are super grippy on flat pedals. Not so grippy on wet leaves and mud. It was a struggle to climb any of the access slides to get back on the road. In hindsight I could have made my way along the heavily bouldered riverbank and possibly climbed out further up. I deemed this too much risk though. After what seemed like half an hour, but was actually 3 minutes, I made it to the top and cycled home. With a clear plan on how to reach the Confluence, I contacted fellow fatbike enthusiast and biking buddy Mark Smith to see if he wanted to join me on my weekend adventure. We set off on Sunday morning. 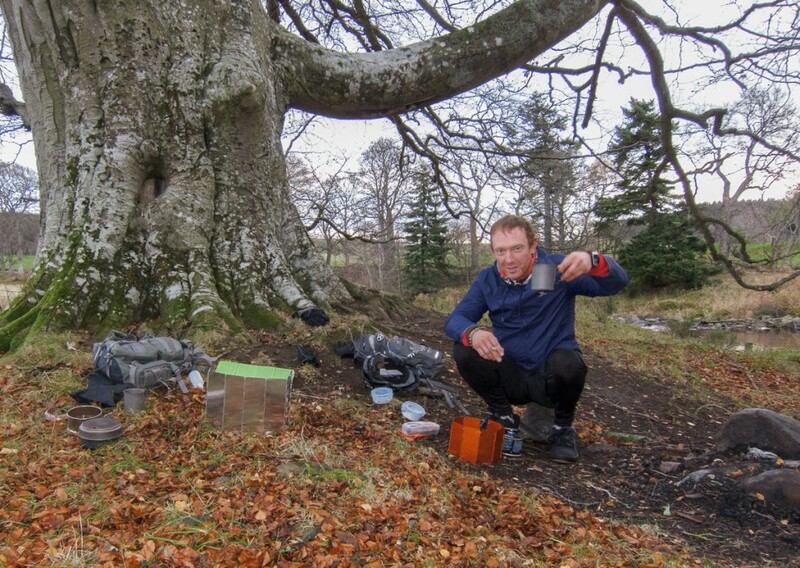 This time I took my bushcraft gear which included stove, green tea and a rope. If we needed to lower the bikes down to the riverbank, I was prepared. I also wore proper hiking boots. We followed the same route, and arrived at the blockage point. Surveying the options, I decided to leave the bikes and walk round the golf course to reach the Confluence. I was also sure we could walk back along the riverside and reach the bikes that way. Finally we reached our goal. The meeting of the waters. 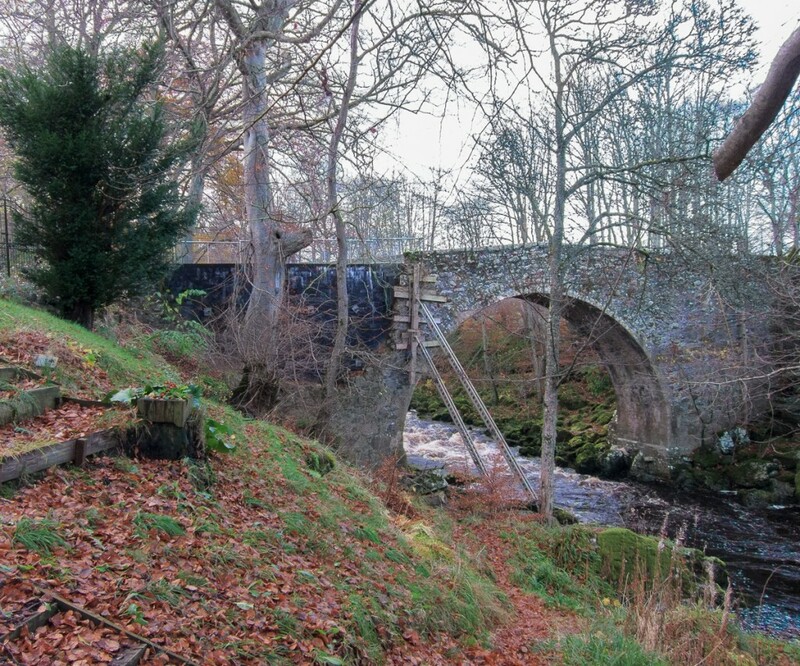 Where the River Deveron meets the River Bogie. It looked smaller than I remembered. 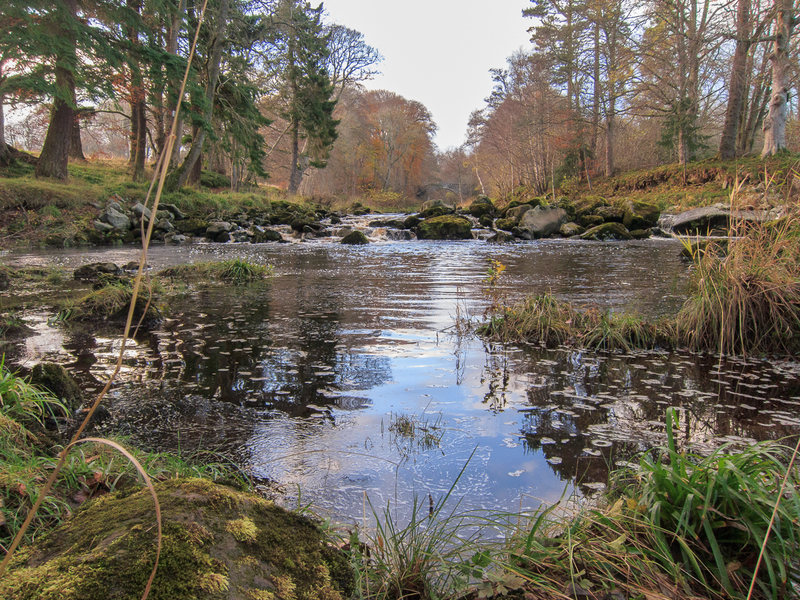 The Deveron doesn’t get significantly wider until the River Isla joins it at Rothiemay. We walked back along the riverbank, and as expected managed to climb the steep hill to reach our bikes. We cycled back to the old bridge and made a scramble up the muddy slide. Hiking boots made little difference. It was still like a scene from Total Wipeout. To finish the adventure, we headed across the bridge and rode the path until we stopped opposite Stuartie’s Cave. We brewed up a cuppa, had a blether and took in the sunset before finally heading home feeling a sense of achievement. 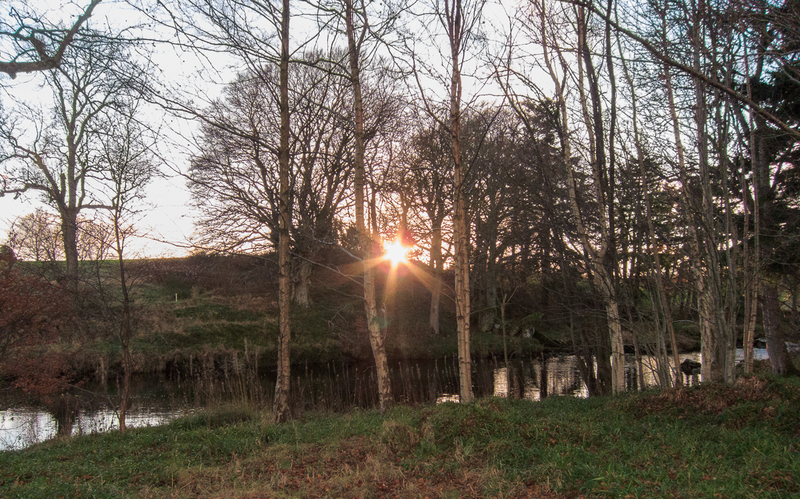 Perhaps the next river adventure will be to cycle from the source of the Deveron. I find cycling very therapeutic. You don’t need to travel miles to a bike park, or ride for hours on end. There are miles of cycling available from your doorstep. Go out and ride whatever bike you have, even for five minutes, and have fun. That was a great read David, thanks for sharing. Just remember & re-read that final sentence, it’s what Lee Craigie said last weeks & the reason I’ve been cycling 40+ years. Inspirational blog from a remarkable man ! Keep on rolling — and blogging ! Many a summer’s day spent at Stuartie’s cave! Or tubing down the Deveron on our tractor tubes. And you are right, it never felt cold. Those were the days!